Abstract: Objective To evaluate the method of differentiation of adipose-derived stem cells (ADSCs) into parathyroid like cells to provide a new theoretical and experimental basis for the cure of hypoparathyroidism after thyroidectomy. Methods SD rats were used, and the fat of the inguinal area was cut. After treatment and culture, ADSCs were identified by the induction of lipid and osteogenesis. ADSCs were induced by Shh and Activin A. ADSC differentiation into parathyroid like cells was confirmed by the detection of parathyroid hormone (PTH). 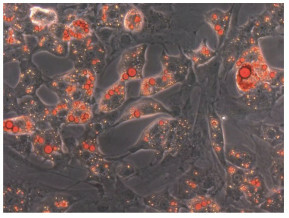 Results ADSCs were successfully isolated from rat adipocytes. 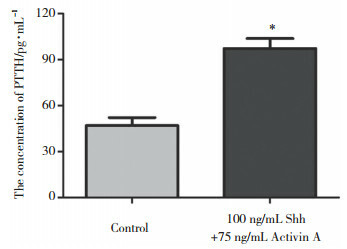 ADSCs were induced using 100 ng/mL Shh +75 ng/mL Activin A for 21 days. 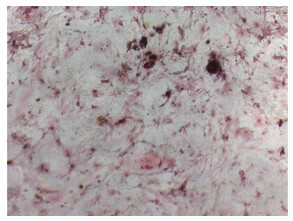 PTH expression in the culture medium increased significantly, which proved that ADSCs had successfully differentiated into parathyroid like cells. Conclusion ADSCs can be differentiated into parathyroid like cells, which will lead to a novel cure for hypoparathyroidism. 朱精强. 甲状腺手术中甲状旁腺保护专家共识[J]. 中国实用外科杂志, 2015, 35(7): 731-736. ATIQ MT, JOARDER AH, ALAM MM, et al. Analysis of post operative complications following total thyroidectomy[J]. Mymensingh Med J, 2011, 20(2): 238-244. 王志宏, 张浩. 异体甲状旁腺移植现状与展望[J]. 中国实用外科杂志, 2012, 32(5): 412-414. 刘宏伟, 程飚, 付小兵. 脂肪源性干细胞临床转化应用中的相关问题[J]. 中国修复重建外科杂志, 2012, 26(10): 1242-1246.